First Contact™ is a polymer solution for effectively and safely cleaning optical components, including high quality lenses, mirrors, and diffraction gratings. Its available either as a clear solution or a red solution. First Contact™ is safe to use with optical glass, metals, Si, Ge, KBr. KRS-5, ZnSe and NaCl, as well as thin films like AR and relfective coatings. It can be used on smooth or rough surfaces, flat of curved surfaces, and continuous or non-continuous surfaces. The fluid polymer shapes easily to the optical surface and the dryed film is removed by simply peeling it off. Note: Red First Contact™ is a polymer solution which uses red polymers. The red is not a colouring added to the solvent system. The colour is in the polymer so it cannot leave anything behind. Like clear First Contact™, it leaves no residue. *CAUTION: The polar organic solvents in First Contact™ Polymer Solutions dissolve certain plastics like acrylics and polycarbonates. 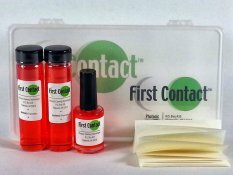 DO NOT USE FIRST CONTACT™ TO CLEAN PLASTIC EYEGLASS LENSES.